Do your kids love chicken nuggets?? I know many of them do,they are pretty addictive.Though not on a regular basis,but kids do demand for these often.I used to feed kids both the frozen and fresh nuggets too at times.When Cherie posted this recipe in her space long back,I bookmarked it right away.The recipe is taken from Australian weekly recipes.I watched this video about Jamie Oliver's food revolution which made me feel sick thinking that I was feeding all junk food to them.I tried this recipe soon after that,came out really good and was impressive.As it was my first attempt,I couldn't click any pics two years back.I had tried many other versions of nuggets like chopping them in bite sized pieces and coated with bread crumbs then frying or baking.However,none of the other recipes came close to the store brought nuggets. This was welcomed by my kids whole heartily and initially I tried frying these nuggets.The fried version was the original recipe.Gradually with repeated trials,I modified to baked version for a healthier version.I added a drop of oil on each of this nuggets to give a crispy fried look and taste as I did for baked vegetable cutlets.These nuggets can be made before hand and can be freezed for future use.Microwave or pan fry after thawing,tastes great.If you happen to watch the above video,am sure you will never go back to store bought chicken nuggets.Give it a try and let kids enjoy healthy food !! Wash and chop the chicken in bite size pieces.Drain water in a colander for 20 minutes. Add the chicken to the blender with bread slices,cheese.Blend until smooth like we do for kebabs. Remove in a bowl,add finely chopped onion,grated potato,grated garlic,chilli flakes,pepper powder and egg.Mix well,add salt as per taste. Line two trays with parchment papers.Scoop out lemon sized ball,flatten and shape like nuggets and roll in bread crumbs.Place on the trays.Similarly,do for the rest of the mixture until you finish the mix. Refrigerate the shaped nuggets with the tray for 30 minutes. 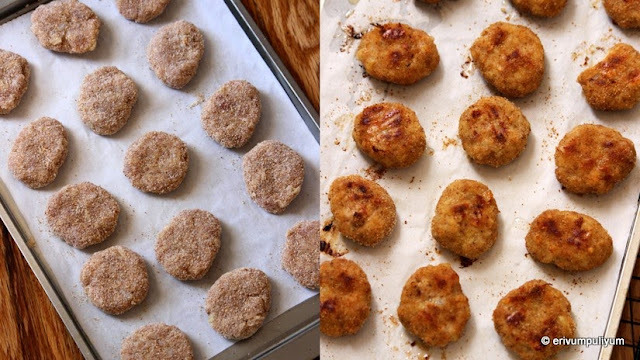 By the last 10 minutes,Pre heat oven at 400 degrees F.Remove the nuggets from refrigerator and add a drop of oil on each nuggets and then place the shaped nuggets in the oven. Bake in oven for 12-15 mins and then flip the other side,add a drop of oil again on this side.Bake again for 7-10 mins or slightly browned in the under side.Remove from oven. Serve warm with ketchup or wait till its completely cooled.Freeze the remaining in ziploc bags for over a month. * I used chicken thighs but you can use chicken breast too(I personally like chicken thighs for the nuggets).If you are preferring the baking method and want them to taste close to any of the store brought nuggets,then add slight amount of chicken fat too.In deep frying,oil adds the flavor on its own(you can omit that). * The nuggets may shrink slightly as it gets cooked so shape accordingly. * You can add your favorite seasoning instead of pepper powder. * Adding potato gives a binding to the mixture. * Parmesan cheese can be replaced with any other cheese as per preference. * In case,your mixture doesn't hold shape then add bread crumbs. Wow this looks so yummy...cant wait to try this recipe..but one thing i need to know that the potato to be added is raw or boiled?if we add the raw one will it get cooked within this time? This chicken nugget recipe is a keeper! They look so tasty. Love them, love them, love them!!! I'll do give them a try. Perfect for my daily diet. Kisses from a very hot Valencia. Nuggets look perfect and yummy. my kids love nuggets. though I keep a pack of store bought ones, I rarely make them, only when I really feel like giving them. Home made is definitely always the best and this one looks so good... bookmarked! Looks like our baked cutlet with cheese and definitely healthier.